AXIe is the “big brother” of PXI. It uses the same PCIe (PCI Express) fabric as PXI, but sports higher power and larger board size. A goal of the consortium is to make AXIe appear to controllers and software as a PXI system, but focused on supporting high-end instrumentation. Like PXI and VXI, it is open to all vendors, and uses similar software drivers, such as IVI and LabView, for instrument control. 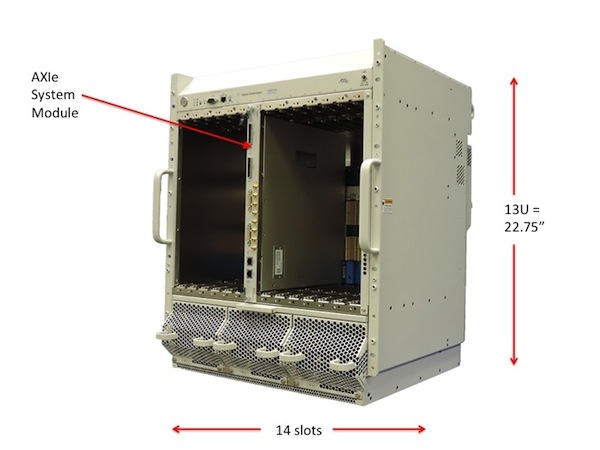 So when Agilent contacted me a few days ago about an upcoming AXIe chassis announcement, I was interested to see these concepts delivered in what is arguably the highest performance open modular chassis yet created. We’ll take a look at it. But even more importantly, it demonstrates some key architectural concepts of AXIe, and some very interesting compatibility modes with PXI. Do you know what an ASM is? An ESM? How about “fire breathing dragon”? Read the entire article here. One of the unique aspects of AXIe is the local bus. As reported back in the March 2013 AXIe Newsletter, the local bus is a unique bus structure that brings a lot of hidden benefits. It is a segmented bus that connects only between adjacent slots. A left to right flow allows very high speed streaming and independent use of each between vendors and applications. 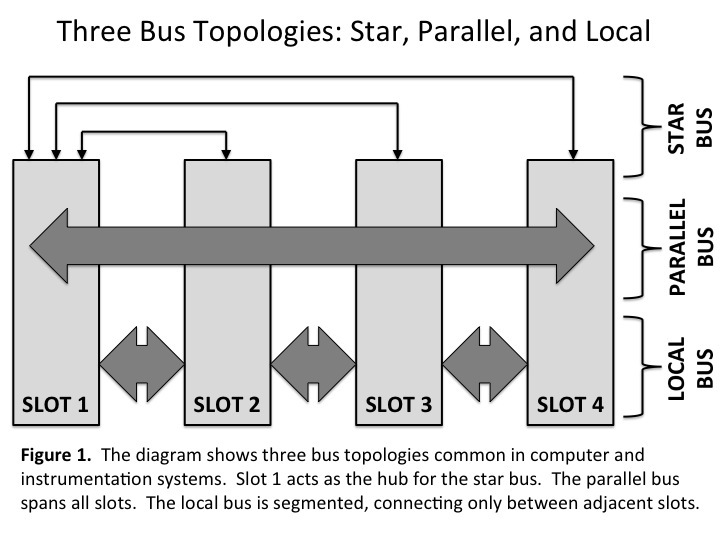 The AXIe local bus topology delivers unique capabilities of performance and flexibility, while retaining interoperability between vendors. The previously demonstrated speed of 40GB/s was already best in class performance. The ability to achieve 80GB/s and effectively double the data-rate, shows that AXIe local bus speeds are able to scale with semiconductor performance, as predicted. This paper was co-written by Lauri Viitas of Guzik, and myself. To read it, go here. 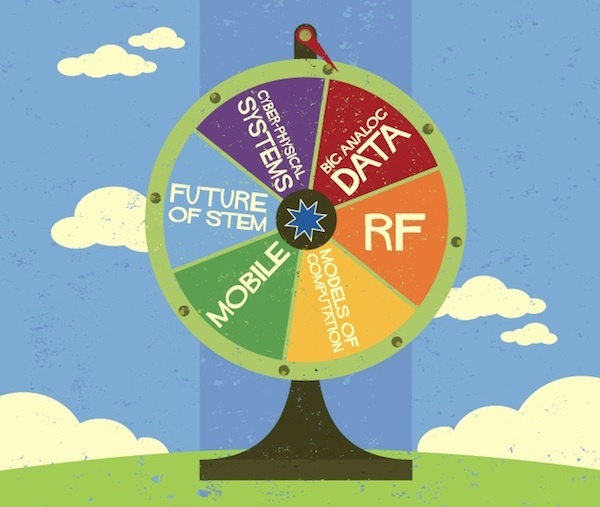 Each year, National Instruments releases an outlook for the industry segments it serves. These are released as documents available from their web site. Last year, NI released four: one each for automated test, data acquisition, embedded control, and education. This year, NI released just two- an overall trend watch across all markets called NI Trend Watch 2014, and another focused specifically on automated testing. Though this column traditionally serves the test market, I’m going to focus this blog post on the overall report, NI Trend Watch 2014. There are many interesting aspects to this report. First of all, as a fellow prognosticator, I have sympathy with NI. 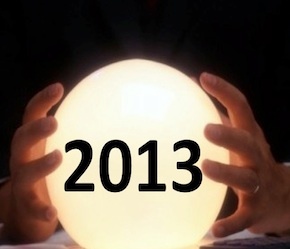 It isn’t easy to predict new trends every year in the measurement industry. There trends are worth a read. But if you have limited time, you can just read my review. 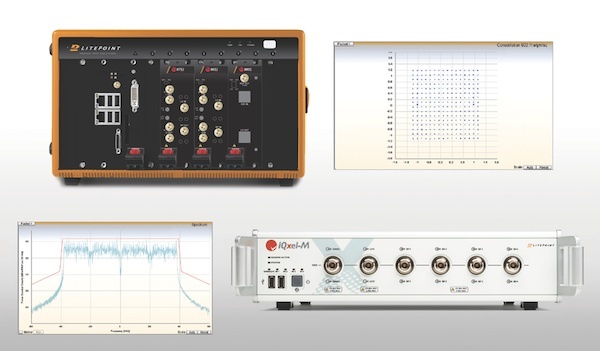 Frequent Test Cafe readers are familiar with the speed advantages of modular instruments. But just to recap, modular standards such as PXI or AXIe gain their speed advantage in functional test applications by avoiding the ASCII interpretation bottleneck of traditional “box” instruments. Recall that traditional instruments are typically programmed by SCPI commands, Standard Commands for Programmable Instruments. These natural language commands take milliseconds to interpret, while driver execution is measured in microseconds. I’ve seen PXI DMMs (digital multimeters) perform a complete measurement in 50 microseconds, including the command time. A traditional LXI instrument wouldn’t have traversed the TCP/IP stack in order to send the first character in that time. The bottom line is that SCPI is optimized for portability, not speed. For top speed, you need pre-compiled high-speed drivers that manipulate an instrument’s native memory map directly over a low latency interface. PCIe-based systems like PXI and AXIe do exactly that. But are there ways around this bottleneck to make traditional box instruments competitive? Yes- there are some tricks that users or manufacturers can employ to narrow the difference or even equalize the playing field. Let’s review some here. So, where are we with modular instrument adoption in 2013? It appears that modular systems have again outgrown traditional instruments by double-digit amounts. Part of this is due to 2013 being a soft year for the industry overall, so this wasn’t a particular large hurdle. However, the relative growth rate of modular instrumentation shows that PXI and AXIe continue to take share from their traditional counterparts. Why is this, and what are the sub-currents? Segment, drivers, acquisitions, architectures, I have it covered. For the most integrated summary you will ever read of the 2013 modular instrument market, go here. Are we addicted to Windows? Test Cafe readers, are we addicted to Microsoft Windows? By “we”, I mean the test community. By “addicted”, I mean we couldn’t do our jobs without it. Using those definitions, the answer is “yes”. Here’s why, and how it happened. The vast majority of programmable bench instruments, whether GP-IB or LXI, use a command language known as SCPI, Standard Commands for Programmable Instrumentation. SCPI is widely deployed in the industry today by dozens of vendors. It offers interoperability and ease of use. Instruments may be programmed from any operating system, since the interpretation of the ASCII commands is performed by the instruments, not instrument drivers. That also is its weakness. Perhaps it is unfair to say that SCPI also means Slow but Compatible Programmable Instruments, but the speed improvements demonstrated by memory-mapped modular systems have been repeated time and time again by multiple vendors. In this article I will review a little history, and articulate the strengths and weaknesses of the SCPI standard. Read the whole thing here. Boom! LitePoint, itself recently acquired by Teradyne, announced the acquisition ofZTEC Instruments. This acquisition signifies much more than the usual consolidation we’ve seen in the test industry these past few years. The modular “disruption” is not only changing the solution set, but bringing new combinations of vendors into play. In an EDN Test Cafe exclusive, I interviewed the principals involved: LitePoint VP of Marketing Curt Schmidek and ZTEC CEO Chris Ziomek. You won’t find anywhere near this insightful coverage. read all about it here. Compatibility and interoperability in test systems: Time to change our vocabulary? Compatible and interoperable are not well defined terms. I’m sure there is a paper somewhere that defines them. And I’m also sure there is another paper that defines them differently. I’m as guilty as anyone else. I’ve been involved with modular standards such as VXI, PXI, and AXIe for nearly three decades. As standards bodies we often do “interoperability testing”, where we test different combinations of chassis, modules, and software. But is this really interoperability testing, compatibility testing, or something else? The truth is that we often use all these terms qualitatively. In this blog post, I will suggest some alternate terms to be more precise. Go here. Have you ever had an a-ha moment? Sure, you have. TheMerriam-Webster dictionary defines it as “a moment of sudden realization, inspiration, insight, recognition, or comprehension.” But I’m taking it one step further — a-ha! with an exclamation point. This is a more dramatic realization. It’s the moment when you discover a great truth, when something that was complicated or unpredictable suddenly becomes clear. As engineers, I’m sure we’ve had many.